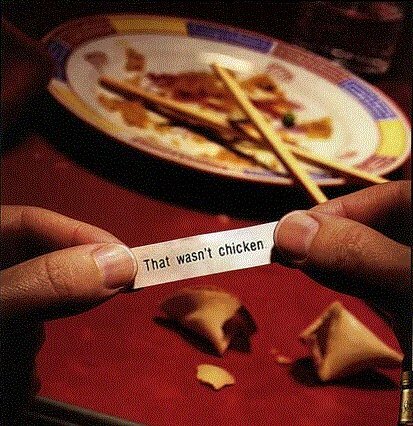 As you can see, you can have a lot of fun with fortune cookies. Or, for all those romantics who love to propose with fortune cookies: you can impress her with your baking skills as well as your clever proposal! Prepare fortunes by typing or printing poetry, proverbs, or your own thoughts on 3 by 1/2-inch strips of paper. Place near oven. Place a straight-sided pan or bowl and a muffin pan near the oven, as well, for shaping and cooling the cookies. Have a pair of clean cotton gloves handy to protect hands while shaping the hot cookies. Preheat oven to 300�F. Grease baking sheets well. In a bowl, combine the flour, cornstarch, sugar and salt. Add the oil and egg whites. Beat until smooth. Beat in the water and vanilla. Drop batter by level tablespoonfuls onto the well-greased baking sheets. Spread out the batter with the back of a spoon into a 4-inch circle. Try only 1 or 2 cookies per sheet at first, until you get the knack of shaping the cookies. Then, advance to 4 circles per sheet as your speed and shaping talent improves. Bake at 300�F for 14 minutes or until light golden brown. Don't underbake the cookies or they will tear during shaping. To shape: Wear cotton gloves. Using a wide spatula, remove one cookie at a time from the oven and flip into your gloved hand. Place and hold one fortune paper in the center of the cookie and quickly fold the cookie in half. Grasp the ends of the cookie and draw it gently down over the edge of the straight-sided pan or bowl to get that "fortune-cookie" curve. (The slit in the cookie will be facing up as you shape the cookie over the pan.) Place the cookie, ends down, in one of the muffin pan cups to cool. This will help them hold their shape while cooling. If the cookie hardens too fast, return it to the oven for about 1 minute to make it more bendable. Repeat for remaining batter, using a cold, well-greased baking sheet for each batch.